February is National Children’s Dental Health Month! For many parents, teaching kids good dental hygiene is a twice-daily battle. But as experts point out, it’s a fight worth having. Though it’s largely preventable, tooth decay remains the most common chronic disease among children aged 6-19, according to the Centers for Disease Control and Prevention. Poor oral hygiene has been linked to everything from speech delays to dental pain and infections to diabetes. If we make sure children receive proper dental education and care early on, it will help them to be healthy throughout their lives. Here are five ways to make brushing and flossing a fun and regular part of your child’s daily routine. 1. Start oral hygiene early: It’s never too early to make brushing and flossing a part of their morning and nightly routines. We want you and your kids to have a positive first experience at our office. We will be kind, gentle, and understanding so that we can help promote a lifetime of successful healthy oral hygiene for your child’s smile. 2.Set a good example: When it comes to teaching good dental hygiene, practice what you preach. A child emulates whatever a parent is doing, so if your child regularly sees you flossing, they are more likely to floss. For added fun, pretend to be a mirror the next time you and your kid brush together, and encourage them to copy your every move. Brush during commercial break. During each 30-second commercial, have your child brush a quadrant of their mouth. By the time they’re done, their show is back on. Just remember to turn off the TV at least a half hour before bedtime to ensure a good night’s sleep. – Set a timer. Overturn an egg timer filled with colorful sand, and challenge them to keep brushing until all the sand has reached the bottom. Or buy your child a toothbrush that blinks or plays music for two minutes. – Play their favorite song. The free app Brush DJ plays tunes in your library for two minutes and – bonus – lets you set reminders to brush twice a day, floss, use a mouthwash, and visit the dentist. 4.Reward Healthy Habits: What kid doesn’t want to stay up a few minutes later at bedtime or be in charge of choosing the next movie for family night? Consider offering a simple reward or creating a rewards chart to encourage your little one to brush their pearly whites for two minutes. 5.Choose the right tools: Brushing and flossing can be difficult for little hands. Opt for age-appropriate tools, such as toddler toothbrushes, flossers without sharp edges, and power toothbrushes, which experts say mimic little circles for accurate brushing. If your child is hesitant to try one, let them feel the movement of the whirring bristles on the palm of their hand before starting. Also let your child pick out their favorite toothbrush and favorite flavor of toothpaste. 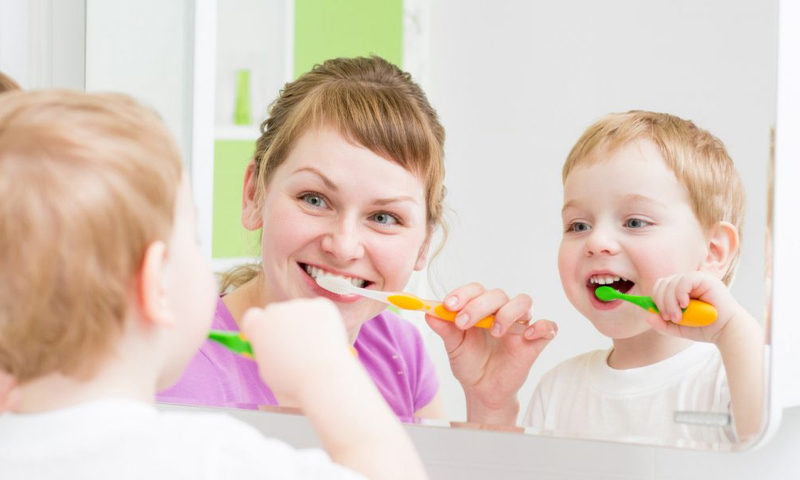 Creating a fun and engaging routine at home will ensure your child develops a lifelong habit of caring for their teeth.